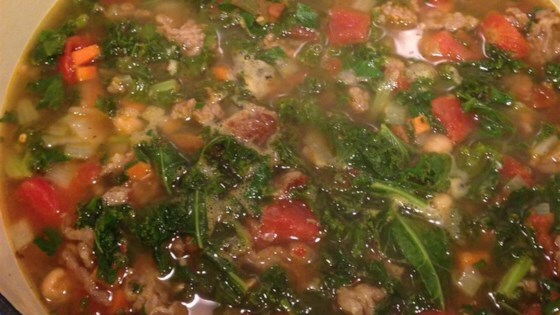 "Lisa didn't know what to do with her kale, so she created a soup that is amazing and full of essential vitamins!" This recipe is excellent! I served it over brown rice, and added less broth, so it was more of a stew than a soup. Now really, does anything need 2 tablespoons of crushed red pepper flakes? Could do with much less otherwise a great recipe. Used white cannelli beans, 8 c of fat free low sodium chicken broth and used spicy chipotle chicken sausage.....excellent and hearty. Loved!